A couple of weeks ago, following the announcement that Duotrope was going paid, I shared a list of free alternatives that might suit the needs of writers who'd ultimately decided not to pony up the cash they were asking for. The reception I got was awesome, as that entry ended up becoming the second most popular thing I've ever posted (thanks in no small part to Jim McDonald sharing the link on Making Light/Diffraction and all of you intelligent, attractive, generally good-smelling people tweeting it around). But there was one unfortunate downside that I noticed while compiling that list: while all of the sites I'd gathered were fantastic resources, none of them could serve as an all-in-one stop for market listings, response stats, and manuscript tracking. You'd have to mix and match a handful of them for that, which obviously isn't as convenient. Fortunately, I was able to make a couple of additions to that list after I posted it, as new projects were brought to my attention that can serve as the one-stop-shop we all hoped would come along. One of them is an intriguing proposal currently seeking funding on IndieGoGo called Submitomancy, but it aims to be more than just a replication of the familiar model. To learn more about this ambitious project, I invited Sylvia Spruck Wrigley to stop by and tell us about Submitomancy, and what makes it more than just a carbon copy of other manuscript tracking sites. Submitomancy’s basic service is quite similar to existing submission tracking systems. The free service has to give users a reason to submit their data and share the results, so that was an easy decision. But when it comes to the subscription services, I knew I wanted to provide manuscript tracking, which goes a step further. Here’s two key points: My interest in a manuscript begins before it is completed. My interest in a manuscript does not end because it has had a single sale. Obviously, a manuscript has to have some meat to it before it’s worth paying attention to; I’m not going to enter every bizarre idea I’ve ever had. But once I’ve taken the time to outline a story and start drafting, if I have a real feeling for the plot and how long it will be, then for me, the manuscript exists in potential. I may not finish it on the spot, but I want to find it again when the time is right. Now honestly, if there’s a call for submission for lusty pirate zombie stories under 5k, I pretty much know without looking if I have anything that fits the bill. I don’t need software to help me do that. However a lot of anthologies and magazines have much vaguer themes. And I have a lot of stories that I might finish, if there was an exciting opportunity for them. Ignoring stories on submission, I probably have 20 that are trunked which could be rewritten, and probably another dozen that are unfinished. The point is that if there’s a call for novellas about near-future science fiction, I want to be able to quickly narrow down my current manuscripts by genre (science fiction) and length to see if I have anything that looks like it might be a match. I want to see those trunked stories and unfinished stories because if one seems like a good match, then that’s what I should be working on next. It’s giving me motivation to finish. For finished stories looking for a home, I just really want the process to be as painless as possible. A search engine can only give near matches: there’s no accounting for style or language for a specific market. For the first search on a new story of a popular length, I’ll get a number of markets that aren't quite right. With Submitomancy, I can place a star next to the best matches, markets where I really feel the story has a chance. 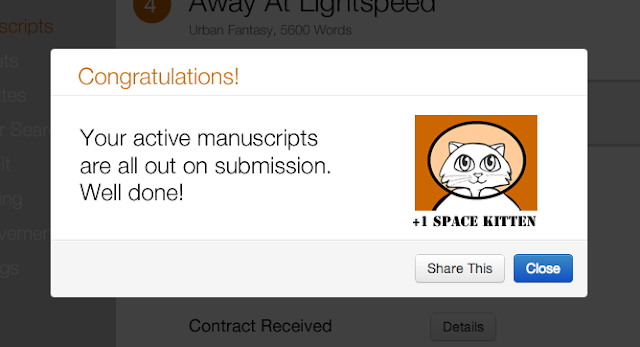 The next time I search to see where that manuscript can go, I’ll see the stars I placed last time. This means that having spent five minutes initially considering which markets are best, I don’t have to think about it again, they are right there for me. But because I’m not just working my way down a list, I’m also seeing new markets and additional opportunities where my filters have changed. Once I’ve chosen a market to submit to, my manuscript data means that it is easy to create a cover letter. At a click of a button, a basic letter is created which includes the market name, the manuscript title, wordcount, genre and my most recent (or favorite) three sales. This is available for me to copy and paste into a form or email where I can customise the letter or send it straight out - but the repetitive bit is taken care of. If I receive an acceptance, then we explode fireworks and space kittens for everyone. But that’s not the end of the story. There’s a whole new set of information that needs tracking: pay rate, contract received, payment received, publication date, exclusivity clause. I can set up a notification to alert me when I can send the story to reprint markets which I can find using a new filtered search. I’ll also be able to see at a glance which sales are completed and whether I received my money. And at the end of the year, I can see exactly how much money I made from short fiction. OK, I don’t need that function, actually. $43.72 not including the free cupcake I got at Eastercon. But THEORETICALLY, it might be important. I’d like Submitomancy to add value with alerts and badges and social networking between writers but at it’s core, it’s about manuscripts and how to make them work harder. If there’s enough interest in Submitomancy then I’ll be refining the details with the Early Access subscribers. But the way I've designed the system, it is only as good as the people who use it. That’s why I’m exploring this with you as a no-risk project for all of us. If you think you’d enjoy being a part of Submitomancy, then please support the campaign and tell your friends. A big thanks to Sylvia for stopping by. The more I read about Submitomancy, the more anxious I am to try it out when it goes live. It honestly sounds like a dream come true for short fiction writers. If you agree, consider visiting the link above and supporting the campaign. Very interesting. I ended up getting a Duotrope gift certificate from my dog for Christmas so I'm sticking with that for now. Of course, I actually need to finish another story or two to continue to take advantage of all those cool features! I'm interested to see what happens with Duotrope, specifically how their statistics are affected by the change. But even if I do keep Duotrope around just to see what happens with it, the extra features on Submitomancy make me salivate either way. I can't wait to use it. Interesting program. I don't have enough written to use something like that though. You know, I've found that keeping my stats up to date on sites and software is one of the thing that motivates me to up my output. It's almost like gamifying my writing. Veeeeery interesting program/information! Think I might have to check this out. Thanks so much for the share, JW! No problem, Randi! Thanks for reading. Wow. I'm impressed. Not to mention that I had no clue such programs even existed. What a relief it would be to streamline all the stories I have laying around for submissions! I am definitely keeping and eye on this, as well. You know, I can't imagine having been a writer in the days before the internet. Services like these are a lifesaver, and Submitomancy looks like it could be one of the best.